There are many independent comics published in recent times that capitalize on the ever -popular Goth culture that permeates our Hot Topic littered landscape. Anyone with the ability to draw mopey girls, cute monsters or disfigured mutant cats (in Gothic black & white of course!) seems to have their own title. However, anyone wanting to look past the pretenders and find the real thing in the realm of ghastly, pitch-black humor needs only to seek out the work of Richard Sala. Reading Sala’s work is like walking through a dimly lit private museum filled with ghoulish relics and curios never meant for the public to see. Maniac killers, grave robbers, insane mystics and all manner of witches and monsters populate his tales. Facing off against the waves of strangeness are hapless male would-be heroes and intrepid & fearless female adventurers. Some believe that Sala is the successor to the pen of illustration master Edward Gorey, but the comparisons don’t go far beyond the grisly (yet sometimes comical) surface of their storytelling. In a graphic sense they couldn’t be much more different. The eerie effect of their art is similar, but while Gorey’s razor sharp, mannered pen work harkens back to the golden age of Victorian illustration, Sala’s art is more reminiscent of the slashing woodcuts associated with German Expressionism. 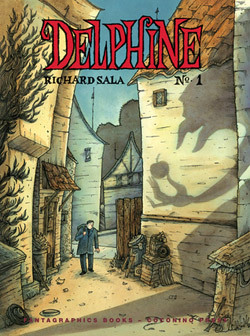 Sala’s latest work (from publisher Fantagraphics) is the four issue mini-series “Delphine”. It concerns a young man who travels to a strange, unfriendly small village in search of his lost love Delphine. Things take a definite turn for the worse when he is misled by locals and left alone in the woods at nightfall. He finds shelter at a woodsman’s cabin only to discover that the threat of supernatural terror does not end at the tree line outside. “Delphine” plays like an inverted version of “Snow White” told from the prince’s point of view. Sala’s art has never looked more lush & moody, an effect enhanced by the series large magazine size format which is printed on quality cream-colored paper in duotone washes. Pickup the first three issues and prep yourself for #4, coming (hopefully) soon. Highly recommended!